WhiskeyKitten is explaining how she made the vampire fangs she is wearing right now. Apparently, there is a kit you can get where you soak the material in hot water and it becomes malleable, so you can fit the fangs to your own teeth and then it hardens later. She says she has had hers for a while and gotten a lot of wear out of them. WhiskeyKitten has a lot of occasions to wear fangs, being a vampire cutie goth girl and all. She has her little mini cemetery and skeleton pet already and it is only the first day of October. If you like gothic girls, and I really really really like gothic girls, then October is basically the best month of the year for cam shows. 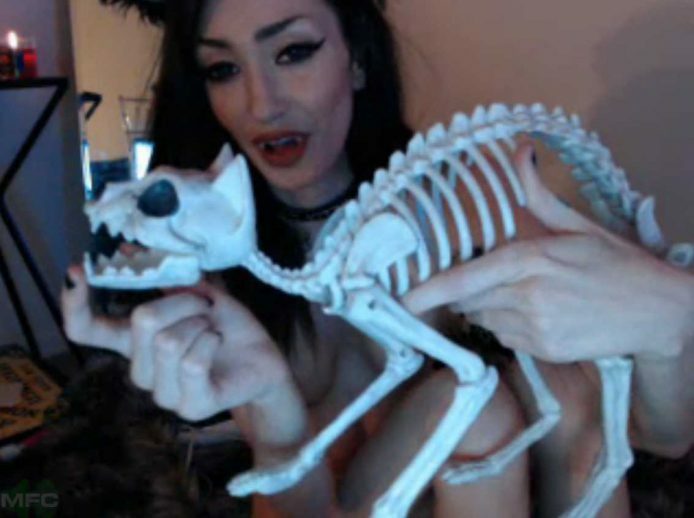 It is really cool that it is free to create a profile to join her chat and get spooky with WhiskeyKitten.